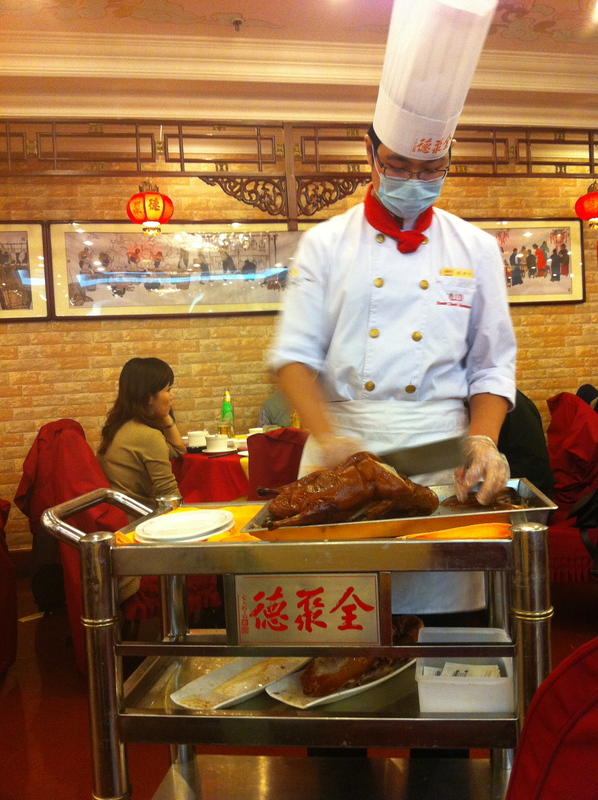 No trip to Beijing is complete without eating some Peking Duck. Now you may be wondering why Peking Duck is so important in Beijing, after all, shouldn’t Peking be the place to get that famous duck? Well, guess what? Beijing is Peking. Yes, I know I’m blowing your mind, but sometimes a mind just needs to be blown and this is one of those times. 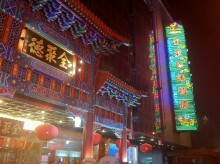 Anyway, it’s hard to walk a block without seeing a sign for roast duck, which is what they call Peking Duck in Beijing. 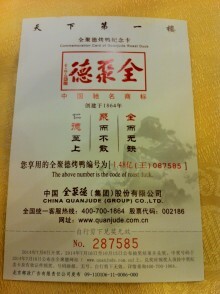 By recommendation, we were sent to Quanjude Roast Duck Restaurant on Wangfujing Street. This is just one of many Quanjude restaurants (all part of the same company) in Beijing, with the original dating all the way back to 1864. 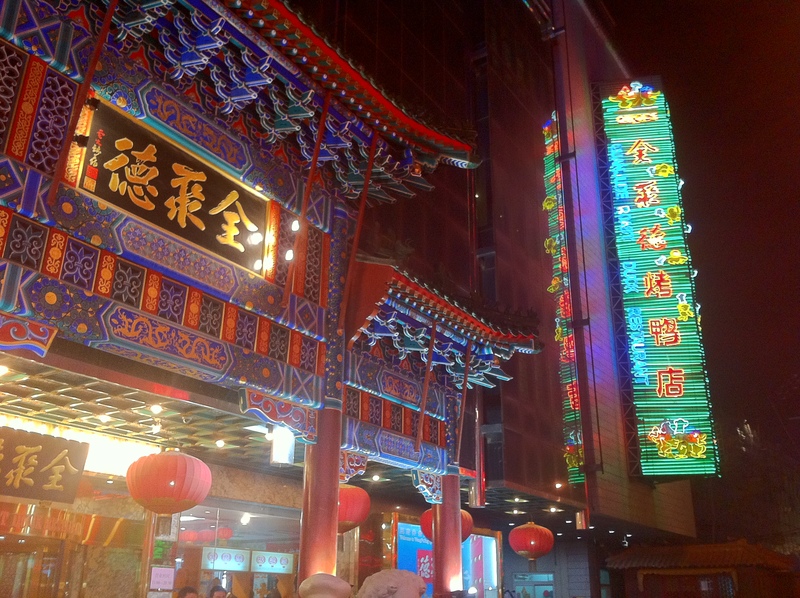 The one we went to on Wangfujing wasn’t hard to find, as Wangfujing is a prominent pedestrian street right in the middle of Beijing. Upon walking in, we realized this was definitely one of the nicer places to eat in China, so we expected the price and the quality of food to be high. In perusing the menu, we found quite the variety of duck. 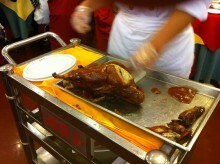 Of course there was the original roast duck, but they had just about as many varieties of duck as Bubba did of shrimp. There was even duck with scorpions, although, that didn’t seem all too tasty. We decided to keep it real and ordered an entire duck, along with a couple sides to mix in with our duck. The first was the steamed flatbread. This was essential to wrap the duck in. We also ordered the hoisin sauce/scallions, which was also supposedly essential for eating the duck. 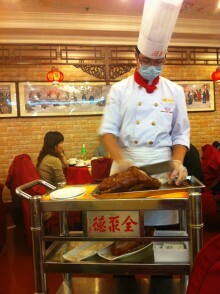 After a little wait, a man wearing a chef’s cap rolled a cart out in front of our table with a fully roasted duck on it. Then he started slicing and dicing our meal. In waves, the sliced up duck was brought to our table and it looked and smelled incredible. The skin was just glistening and the meat looked juicy and tender. The steamed flatbread essentially acts like a tortilla does with a taco. In fact there is little difference between it and a tortilla except that it is lighter and steamed. First, the flatbread gets a few dabs of hoisin and scallions. Then you pile on some duck. Being the fattiest part, the skin unsurprisingly also carries much of the flavor, so every little duck taco needs plenty of skin. Once it was all wrapped up, my Peking Duck was ready to be eaten. Just look at that glisten. I bit in and it was quite amazing. 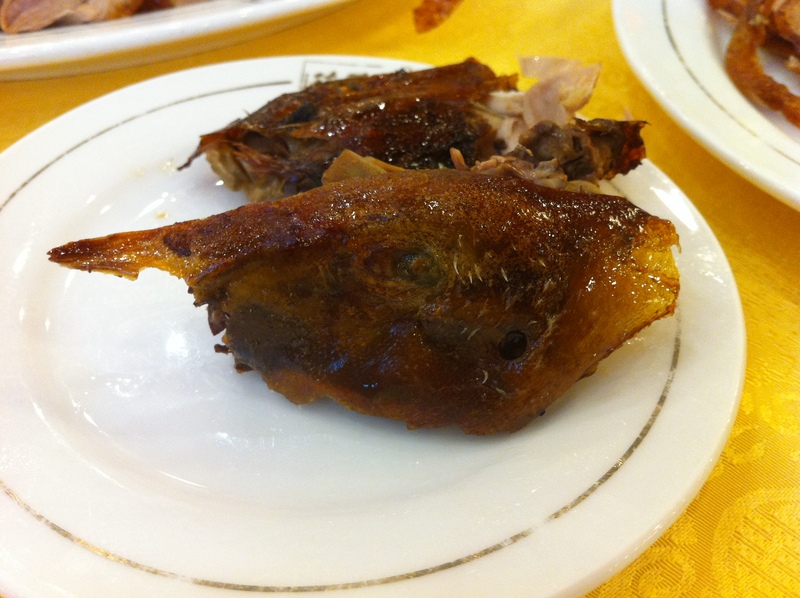 This was not simply duck that had been roasted, this was roasted duck that had been perfected over time for more than 140 years. It was no wonder the Imperial family ate this recipe. The duck (Donald?!) was juicy, flavorful and even sweet at times. I found myself putting in more skin than meat to get extra flavor because it was just that good. The hoisin and scallions went well with the meat and definitely improved the overall duck consumption. Stop looking at me, Donald! Finally, after bringing us all the duck’s meat, we were given the duck’s head on a platter. Perhaps this was for proof, but I did eat a little of the cranial meat and it just wasn’t as tasty as the rest of the duck. Sorry, Donald, but I’ll stick with your torso meat instead. Finally, we exhausted our duck supply. Part of me felt like I could have eaten another half duck, but another part of me thought this probably wasn’t a good idea. Sometimes it’s just better to leave wanting more. Proof our duck existed once. 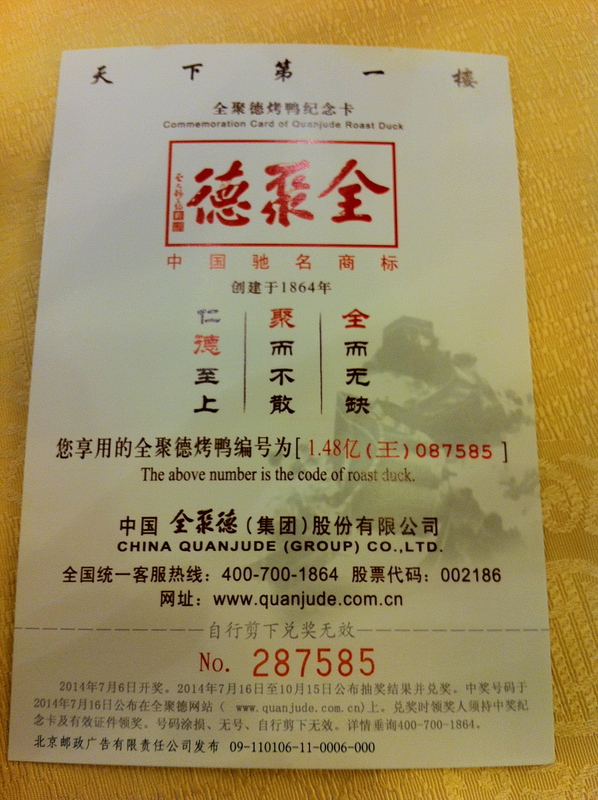 During the course of the meal, we were presented with a post card for the restaurant. But this wasn’t some scenic view of the restaurant, instead it told us our duck number, which was number 287585. I’m pretty sure in over 140 years they have gone through more than 300,000 ducks, (if they only went through 100 ducks a day, they would have reached 300,000 in under 10 years) so I’m not sure what the significance of the number was, other than to give us some sort of duck certification. Whatever the reason, it was good to know we had been counted. At the end of the meal, we were given bowls of duck soup. Perhaps this was all that was left of our little Donald, and we slurped him down. The soup was thick and pretty packed with duck flavor. The flavor was distinct from that of our roast duck, but still pretty good. It should be known that the Chinese prefer to drink soup after meals (supposedly it is healthier), so this wasn’t abnormal to get our soup when we did. It was a good way to wash down a delicious meal. The only real downside of the meal was that they charged twice for our duck fixings (flatbread, hoisin) even though it seemed like we had only ordered one of each. Even though we each were served our own dishes, this still seemed pretty sneaky. Nonetheless, a few extra bucks was not enough to ruin the delicious meal. Quanjude Roast Duck Restaurant was a tasty way to enjoy Beijing’s obligatory Peking Duck and I would recommend it for anyone who ends up in Beijing. Unless you hate flavor, you won’t be disappointed. this meal was amazing!!! 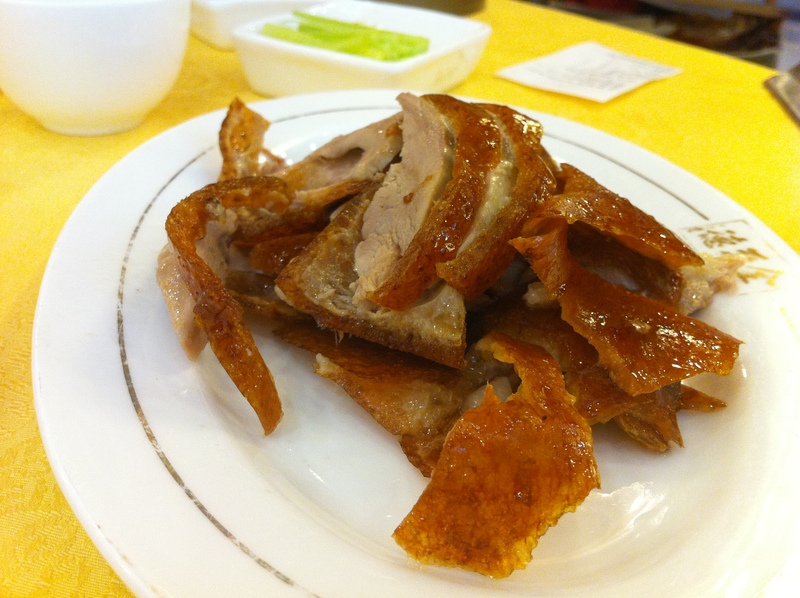 if you go to beijing it would be a shame to miss duck cut up before your eyes… its a must! That number is for the lucky draw. What is the lucky draw?